SITC Conference, Maryland · 2017, Galon J. et al. Material and Methods: Tumor tissues pre- (biopsy) and post-treatment (resection) are collected from patients with locally advanced STS (NCT02379845), who received either HfO2-NP activated by RT or RT alone. Immunohistochemistry and Digital Pathology for immune biomarkers and Pan-Immune gene expression profiling are analyzed. 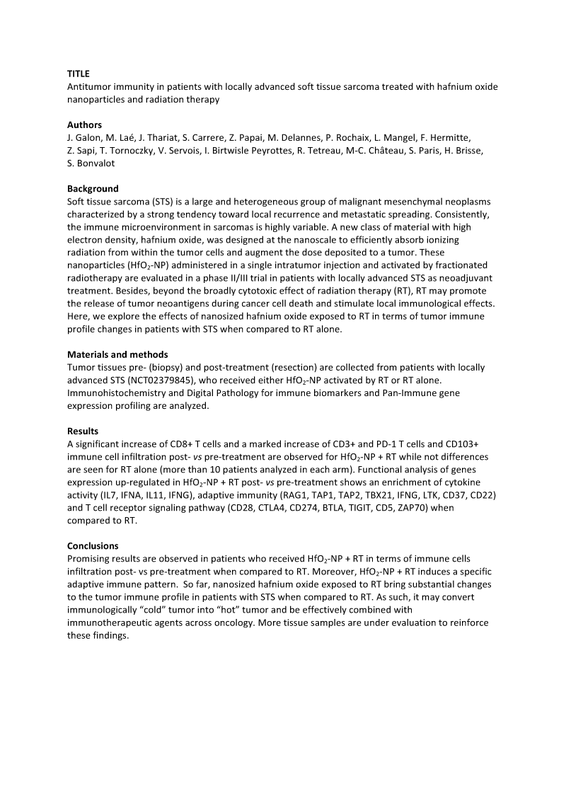 Results: A significant increase of CD8+ T cells and a marked increase of CD3+ and PD-1 T cells and CD103+ immune cell infiltration post- vs pre-treatment are observed for HfO2-NP + RT while not differences are seen for RT alone (more than 10 patients analyzed in each arm). Functional analysis of genes expression up-regulated in HfO2-NP + RT post- vs pre-treatment shows an enrichment of cytokine activity (IL7, IFNA, IL11, IFNG), adaptive immunity (RAG1, TAP1, TAP2, TBX21, IFNG, LTK, CD37, CD22) and T cell receptor signaling pathway (CD28, CTLA4, CD274, BTLA, TIGIT, CD5, ZAP70) when compared to RT.